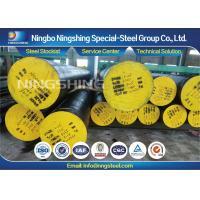 Home Companies Ningbo Ningshing Special-Steel Group Co., Ltd.
AISI / SAE 4145H grade is a low-alloy steel containing chromium and molybdenum as strengthening agents. The steel has good fatigue strength and impact toughness in low temperature, weldability and machinability. This low-alloy steel is used in heat treated condition with 120 KSI minimum yield strength for oil and gas equipments of well drilling, wellhead, Christmas tree, etc. acc.to the common international specifications or customerized. Machining and heat treatment are available. Also, we advise you in choosing the right materials. Cold Work Tool Steel D3 1.2080 SKD1 √ Cutting Tools, Punching Tools, Shear Bladers, Reamers, Thread Rolling Dies, Calipers, Sockets etc. P20 1.2311 —— √ Mold Base, Core & Cavity, Bumper Mold etc. Shafts, Gears, Drillers, Chains, Bolts, Nuts, Pins, Suds, Keys, Bites, Crankshafts, Connecting Rods, Came, Couplings etc. Carbon Steel 1010 CK10 / C10E / 1.1121 S10C Shafts, Chains, Bolts, Nuts, Pins, Suds, Keys, Bites, Came, Couplings etc.